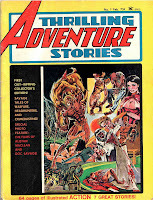 Atlas/Seaboard's Thrilling Adventure Stories made its debut in November, 1974. To make this an extra-special Thanksgiving treat, I thought I'd share not one, but two far-out features from that magnificent mag's pulse-pounding pages. See who loves ya, baby? First up is "Tigerman and the Flesh Peddlers" by John Albano and Ernie Colon! Now dig into "Lawrence of Arabia" by Jeff Rovin and Frank Thorne! Thrilling Adventure Stories # 1 was pretty meh. But # 2 is considered one of the best BW ever published. Remember, one man's "meh" is another man's "WOW!" But I agree, issue #2 is an example of near comicbook perfection. Walt Simonson considers his "Temple of the Spider" contribution for # 2 one of the best things he ever did. Oh, I hope we get to see part two of Lawrence of Arabia. I had no idea this strip existed! Alas, there never was a part two. Bought this for Tiger-Man. Loved Tiger-Man, the Grim Ghost, the Brute, Planet of the Vampires,the Destructor, Demon Hunter, Man-Monster and Ironjaw. I thought the first two issues of Wulf the Barbarian were fantastic. Actually, this was Tigerman's first appearance. For whatever reason, it made it to the stores before his own comic--which, for those of us who bought it new, made the story a bit puzzling. What can I say, Groovester? You're the one that inspired me to get into this whole blogging thing in the first place! It's all your fault!! !